Roger Clemens (left) and Randy Johnson (right) are the only pitchers to strike out 18 or more batters in a nine-inning game on three separate occasions. In baseball, a strikeout occurs when a pitcher throws three strikes to a batter during his time at bat. Twenty different pitchers have struck out at least 18 batters in a single nine-inning Major League Baseball (MLB) game as of 2016,[a] the most recent being Max Scherzer of the Washington Nationals on May 11, 2016. Four players have accomplished the feat more than once in their career; no player has ever struck out more than 20 batters in a nine-inning game. Charlie Sweeney was the first player to strike out 18 batters in a single game, doing so for the Providence Grays against the Boston Beaneaters on June 7, 1884. In spite of this, Bob Feller is viewed as the first pitcher to accomplish the feat, since his then-record 18 strikeouts was the first to occur during the 20th century and the live-ball era. Out of the twenty pitchers who have accomplished the feat, fifteen were right-handed and five pitched left-handed. Five of these players have played for only one major league team. Five pitchers—Steve Carlton, Roger Clemens, Randy Johnson, Nolan Ryan and Tom Seaver—are also members of the 3,000 strikeout club. Sweeney has the fewest career strikeouts in the group with 505, while Nolan Ryan, with 5,714, struck out more batters than any other pitcher in major league history. Bill Gullickson and Kerry Wood are the only rookies to have achieved the feat. Tom Seaver concluded his milestone game by striking out the final ten batters he faced, setting a new major league record for most consecutive strikeouts. Of the eleven players eligible for the Baseball Hall of Fame who have struck out 18 batters in a game, six have been elected; all six were elected on the first ballot. Players are eligible for the Hall of Fame if they have played in at least 10 major league seasons, and have either been retired for five seasons or deceased for at least six months. These requirements leave two players ineligible who are active, two players ineligible who are living and have played in the past five seasons, and five who did not play in 10 major league seasons. Kerry Wood tied Roger Clemens' major league record of 20 strikeouts in a nine-inning game on May 6, 1998. Sandy Koufax is one of six pitchers who have 18 strikeouts in a game to be inducted into the Baseball Hall of Fame. Bob Feller was the first player to achieve 18 strikeouts in a game during the live-ball era. Max Scherzer tied Kerry Wood and Roger Clemens' major league record of 20 strikeouts in a nine-inning game in 2016. Nolan Ryan amassed 18 or more strikeouts in a nine-inning game twice, as well as 19 strikeouts in extra-inning games three times. Seven different pitchers have struck out at least 18 batters in an extra-inning Major League Baseball (MLB) game to date. Only Nolan Ryan accomplished the feat more than once in his career and no player has ever struck out more than 21 batters in a game. The following list is kept separate from the above list of pitchers who have struck out 18 or more batters in a nine-inning game. This is due to the differing number of innings pitched during an extra-inning game, the lack of a definitive endpoint to the game that would otherwise allow for a fair comparison to be made, and the advantage of having more opportunities to strike out players during an extra-inning game as opposed to one lasting nine innings. ^ 18 strikeouts is utilized as the benchmark because it signifies approximately ​2⁄3 of a nine-inning game's 27 outs were made by a single pitcher via a strikeout ("approximately" due to the fact that a pitcher can record more than three strikeouts in an inning with the uncaught third strike rule). ^ Although the game went into extra innings (11 total), Johnson was relieved by Byung-hyun Kim after nine innings. ^ "Official Baseball Rules" (PDF). MLB.com. MLB Advanced Media. 2012. Retrieved March 6, 2013. ^ "Official Rules: 6.00 – The Batter". MLB.com. MLB Advanced Media. Retrieved March 6, 2013. ^ Collier, Jamal (May 12, 2016). "Roaring 20! Max Ties K Mark, Mauls Tigers". MLB.com. MLB Advanced Media. Retrieved May 12, 2016. ^ Caruso, Gary (October 25, 1995). The Braves Encyclopedia. Temple University Press. p. 15. ISBN 9781566393843. Retrieved December 1, 2012. ^ Goldstein, Richard (December 15, 2010). "Bob Feller, Whose Fastball Dazzled, Dies at 92". The New York Times. Retrieved December 1, 2012. ^ Blevins, Dave (December 23, 2011). The Sports Hall of Fame Encyclopedia: Baseball, Basketball, Football, Hockey, Soccer. Scarecrow Press. p. 15. ISBN 9781461673705. Retrieved December 1, 2012. ^ Allen, Maury (May 8, 1961). "The 18 Strikeouts Of Bob Feller". Sports Illustrated. CNN. Retrieved December 1, 2012. ^ a b "Bill Gullickson Statistics and History". Baseball-Reference.com. Sports Reference LLC. Retrieved December 1, 2012. ^ a b "Kerry Wood Statistics and History". Baseball-Reference.com. Sports Reference LLC. Retrieved December 1, 2012. ^ Bock, Hal (April 23, 1970). "Seaver Fans 19". Ocala Star-Banner. Associated Press. p. 2B. Retrieved March 4, 2013. ^ "May 11, 2016 Detroit Tigers at Washington Nationals Play by Play and Box Score". Baseball-Reference.com. Sports Reference LLC. May 11, 2016. Retrieved October 12, 2016. ^ "Max Scherzer Statistics and History". Baseball-Reference.com. Sports Reference LLC. Retrieved October 12, 2016. ^ "May 6, 1998 Houston Astros at Chicago Cubs Play by Play and Box Score". Baseball-Reference.com. Sports Reference LLC. May 6, 1998. Retrieved December 8, 2012. ^ "September 18, 1996 Boston Red Sox at Detroit Tigers Play by Play and Box Score". Baseball-Reference.com. Sports Reference LLC. September 18, 1996. Retrieved September 5, 2010. 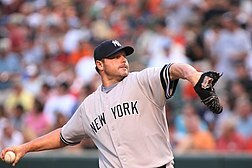 ^ a b c "Roger Clemens Statistics and History". Baseball-Reference.com. Sports Reference LLC. Retrieved December 1, 2012. ^ "April 29, 1986 Seattle Mariners at Boston Red Sox Play by Play and Box Score". Baseball-Reference.com. Sports Reference LLC. April 29, 1986. Retrieved September 5, 2010. ^ "August 8, 1997 Chicago White Sox at Seattle Mariners Play by Play and Box Score". Baseball-Reference.com. Sports Reference LLC. August 8, 1997. Retrieved December 9, 2012. 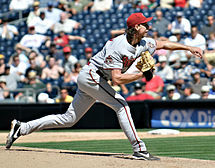 ^ a b c d "Randy Johnson Statistics and History". Baseball-Reference.com. Sports Reference LLC. Retrieved December 1, 2012. ^ "June 24, 1997 Oakland Athletics at Seattle Mariners Play by Play and Box Score". Baseball-Reference.com. Sports Reference LLC. June 24, 1997. Retrieved December 9, 2012. ^ "October 6, 1991 New York Mets at Philadelphia Phillies Play by Play and Box Score". Baseball-Reference.com. Sports Reference LLC. October 6, 1991. Retrieved September 5, 2010. ^ "David Cone Statistics and History". Baseball-Reference.com. Sports Reference LLC. Retrieved December 1, 2012. ^ "August 12, 1974 Boston Red Sox at California Angels Play by Play and Box Score". Baseball-Reference.com. Sports Reference LLC. August 12, 1974. Retrieved September 5, 2010. ^ a b c d e "Nolan Ryan Statistics and History". Baseball-Reference.com. Sports Reference LLC. Retrieved December 1, 2012. ^ "April 22, 1970 San Diego Padres at New York Mets Play by Play and Box Score". Baseball-Reference.com. Sports Reference LLC. April 22, 1970. Retrieved September 5, 2010. ^ "Tom Seaver Statistics and History". Baseball-Reference.com. Sports Reference LLC. Retrieved December 1, 2012. ^ "September 15, 1969 New York Mets at St. Louis Cardinals Play by Play and Box Score". Baseball-Reference.com. Sports Reference LLC. September 15, 1969. Retrieved September 5, 2010. ^ "Steve Carlton Statistics and History". Baseball-Reference.com. Sports Reference LLC. Retrieved December 1, 2012. ^ Vaccaro, Frank. "Hugh Daily". The Baseball Biography Project. Society for American Baseball Research. Retrieved December 9, 2012. ^ "Hugh Daily Statistics and History". Baseball-Reference.com. Sports Reference LLC. Retrieved December 1, 2012. ^ "The Ballplayers – Charlie Sweeney". BaseballLibrary.com. Baseball Library. Archived from the original on November 3, 2012. Retrieved December 9, 2012. ^ "Charlie Sweeney Statistics and History". Baseball-Reference.com. Sports Reference LLC. Retrieved December 1, 2012. ^ "May 13, 2015 St. Louis Cardinals at Cleveland Indians Play by Play and Box Score". Baseball-Reference.com. Sports Reference LLC. May 13, 2015. Retrieved May 15, 2015. ^ "Corey Kluber Statistics and History". Baseball-Reference.com. Sports Reference LLC. Retrieved May 15, 2015. ^ "May 16, 2004 Atlanta Braves at Milwaukee Brewers Play by Play and Box Score". Baseball-Reference.com. Sports Reference LLC. May 16, 2004. Retrieved September 5, 2010. ^ "Ben Sheets Statistics and History". Baseball-Reference.com. Sports Reference LLC. Retrieved December 1, 2012. ^ "August 25, 1998 Kansas City Royals at Toronto Blue Jays Play by Play and Box Score". Baseball-Reference.com. Sports Reference LLC. August 25, 1998. Retrieved September 5, 2010. ^ "September 27, 1992 Seattle Mariners at Texas Rangers Play by Play and Box Score". Baseball-Reference.com. Sports Reference LLC. September 27, 1992. Retrieved September 5, 2010. ^ "June 4, 1990 Atlanta Braves at Los Angeles Dodgers Play by Play and Box Score". Baseball-Reference.com. Sports Reference LLC. June 4, 1990. Retrieved September 5, 2010. ^ "Ramon Martinez Statistics and History". Baseball-Reference.com. Sports Reference LLC. Retrieved December 1, 2012. ^ "September 10, 1980 Chicago Cubs at Montreal Expos Play by Play and Box Score". Baseball-Reference.com. Sports Reference LLC. September 10, 1980. Retrieved September 5, 2010. ^ "June 17, 1978 California Angels at New York Yankees Play by Play and Box Score". Baseball-Reference.com. Sports Reference LLC. June 17, 1978. Retrieved September 5, 2010. ^ "Ron Guidry Statistics and History". Baseball-Reference.com. Sports Reference LLC. Retrieved December 1, 2012. ^ "September 10, 1976 California Angels at Chicago White Sox Play by Play and Box Score". Baseball-Reference.com. Sports Reference LLC. September 10, 1976. Retrieved September 5, 2010. ^ "July 14, 1968 Houston Astros at Cincinnati Reds Play by Play and Box Score". Baseball-Reference.com. Sports Reference LLC. July 14, 1968. Retrieved September 5, 2010. ^ "Don Wilson Statistics and History". Baseball-Reference.com. Sports Reference LLC. Retrieved December 1, 2012. ^ "April 24, 1962 Los Angeles Dodgers at Chicago Cubs Play by Play and Box Score". Baseball-Reference.com. Sports Reference LLC. April 24, 1962. Retrieved September 5, 2010. 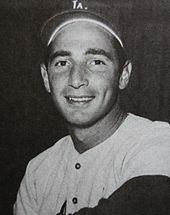 ^ a b "Sandy Koufax Statistics and History". Baseball-Reference.com. Sports Reference LLC. Retrieved December 1, 2012. ^ "August 31, 1959 San Francisco Giants at Los Angeles Dodgers Play by Play and Box Score". Baseball-Reference.com. Sports Reference LLC. August 31, 1959. Retrieved September 5, 2010. ^ "October 2, 1938 Detroit Tigers at Cleveland Indians Play by Play and Box Score". Baseball-Reference.com. Sports Reference LLC. October 2, 1938. Retrieved September 5, 2010. ^ "Bob Feller Statistics and History". Baseball-Reference.com. Sports Reference LLC. Retrieved December 1, 2012. ^ Bevis, Charlie. "George Bignell". The Baseball Biography Project. Society for American Baseball Research. Retrieved December 9, 2012. ^ "Henry Porter Statistics and History". Baseball-Reference.com. Sports Reference LLC. Retrieved December 1, 2012. ^ "Early Records Of Lou Gehrig While At College Minus". The Lewiston Daily Sun. April 16, 1929. p. 11. Retrieved December 9, 2012. ^ "Dupee Shaw Statistics and History". Baseball-Reference.com. Sports Reference LLC. Retrieved December 1, 2012. ^ "September 12, 1962 Washington Senators at Baltimore Orioles Play by Play and Box Score". Baseball-Reference.com. Sports Reference LLC. September 12, 1962. Retrieved January 26, 2013. ^ "Tom Cheney Statistics and History". Baseball-Reference.com. Sports Reference LLC. Retrieved January 26, 2013. ^ a b "May 8, 2001 Cincinnati Reds at Arizona Diamondbacks Play by Play and Box Score". Baseball-Reference.com. Sports Reference LLC. May 8, 2001. Retrieved January 26, 2013. ^ "July 3, 1968 Minnesota Twins at Cleveland Indians Play by Play and Box Score". Baseball-Reference.com. Sports Reference LLC. July 3, 1968. Retrieved January 26, 2013. ^ "Luis Tiant Statistics and History". Baseball-Reference.com. Sports Reference LLC. Retrieved January 26, 2013. ^ "June 14, 1974 Boston Red Sox at California Angels Play by Play and Box Score". Baseball-Reference.com. Sports Reference LLC. June 14, 1974. Retrieved February 28, 2013. ^ "August 20, 1974 Detroit Tigers at California Angels Play by Play and Box Score". Baseball-Reference.com. Sports Reference LLC. August 20, 1974. Retrieved February 28, 2013. ^ "June 8, 1977 Toronto Blue Jays at California Angels Play by Play and Box Score". Baseball-Reference.com. Sports Reference LLC. June 8, 1977. Retrieved February 28, 2013. ^ "June 14, 1952 Chicago Cubs at Boston Braves Play by Play and Box Score". Baseball-Reference.com. Sports Reference LLC. June 14, 1952. Retrieved February 28, 2013. ^ "Warren Spahn Statistics and History". Baseball-Reference.com. Sports Reference LLC. Retrieved February 28, 2013. ^ "October 2, 1965 Philadelphia Phillies at New York Mets Play by Play and Box Score". Baseball-Reference.com. Sports Reference LLC. October 2, 1965. Retrieved February 28, 2013. ^ "Chris Short Statistics and History". Baseball-Reference.com. Sports Reference LLC. Retrieved February 28, 2013. ^ "June 14, 1965 New York Mets at Cincinnati Reds Play by Play and Box Score". Baseball-Reference.com. Sports Reference LLC. June 14, 1965. Retrieved February 28, 2013. ^ "Jim Maloney Statistics and History". Baseball-Reference.com. Sports Reference LLC. Retrieved February 28, 2013. This page was last edited on 27 February 2019, at 11:52 (UTC).